Going along to Cannes Lions for the first time this year and looking to make the most of every moment? Then here are are some tips for what to do along the way this year. At the festival you will hear from brilliant minds from all walks of life beyond just advertising. Voices from politics, tech, entertainment, sustainability and beyond offer amazing insights that can provide inspiration and spark meaningful conversations. Think beyond what you feel are the immediate needs of your company or company’s clients as some of the best takeaways can come from unexpected topics. Over the past few years, Cannes Lions has changed from being extremely agency-centric to being a bit more inclusive. The festival now attracts a much more diverse cross-section of the industry and this broader lens can allow you to connect with contacts you may have not otherwise crossed paths with. Perhaps that guy with swag sunglasses and a t-shirt may not look flashy, but he likely has substance that does not meet the eye. In Cannes, the people with the loudest roar, are the smaller lions. Don’t judge a book by its cover and connect with friends. You may feel like you won’t regret spending a pretty penny on a wardrobe that is only befitting of a week on the French Riviera, but consider not only if you will wear it again outside your cousin’s polo-themed birthday party, but if it will actually make it there. Every year there are tales of luggage that arrives just in time to head back home, so make sure you bring a carry on with the essentials: two days worth of clothes, medications, chargers, toiletries, etc. Your schedule will fall into place when you’re there and will constantly shift depending on the people you are with, but get your name on every RSVP list you can. Options are your friends. Yes, Cannes is filled with extravagant parties and endless rosé, but it’s still a business affair. While it may seem like a great idea to check out the Gutter Bar at 4am, it could likely turn into a bad decision the next day or worse, the next week at the office. The best view of the Gutter Bar is a pass by on your way home. 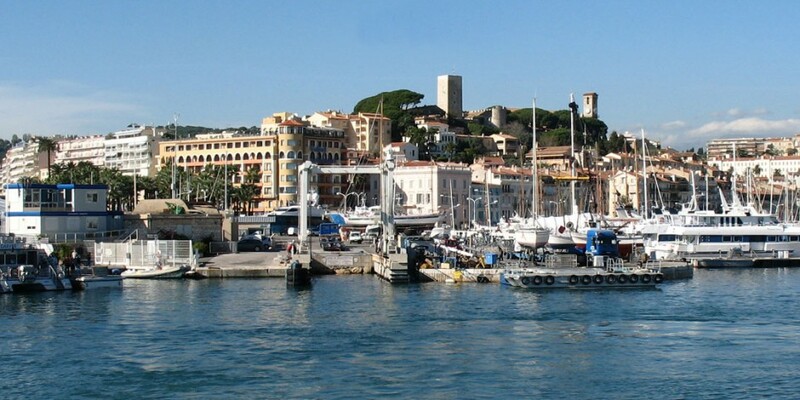 While it may be tempting to spend the week networking and mingling with your fellow countrymen, Cannes is an opportunity to connect with creative minds from all over the world. Ditch your normal crew in lieu of a party hosted by a foreign country with no one you know. Is it a nice summer night? Yes, but that doesn’t mean you should walk home alone. Be smart and stick together. If you need a ride, book it in advance. Ubers get booked up pretty quickly, so get the card of the local taxi driver that drove you from the Nice Airport so you have a reliable local option. Water, fresh fruit, bread, cheese and meat are great to have on hand. Local restaurants close early, so if you come home from a late night dance fest starving, you won’t be a happy camper without any snacks on hand. Check out the farmer’s market by the Palais for great deals on fresh local foods. If you’re feet are weary from trekking the 2 km stretch of the Croisette, you have options to park it and have the networking come to you. The Carlton Hotel is the U.S. homebase and if you are lucky enough to grab a spot on the terrace (tipping is your friend here) between 4pm – 7pm, you are guaranteed to bump into the top names in advertising taking their last meetings and getting ready to head into the evening. The Martinez Hotel is a great late night spot for a more European crowd. The Gutter Bar (also known at 72 Criosette) is a mix of everyone, but is notoriously on the rowdy side. While it can be unpredictable what will be the most buzzed-about topics at Cannes, it’s important to be aware of the recent trends and shifts so you can stay afloat in conversation. This year, be prepared to chat about: GDPR, brand safety, World Cup, blockchain, Time’s Up (and Diet Madison Avenue), consultancies, AI/VR/AR (and if you think it matters), Facebook & data protection and in-house agencies. Introduce yourself. Talk to people. Ask them about themselves. Blasting someone with info about you and your company doesn’t fly. Make contacts through real conversations and business chats will eventually follow. No matter how jaded one can become from years of experience in advertising, we are truly lucky to be in an industry of smart and creative people who take pride in their craft. Cannes Lions is the one time a year that we all gather to connect from all over the world. Some of the most wonderful friends and business associates that I’ve made over the years, I’ve connected with at Cannes. So pack up your business cards and sunscreen, and get ready for a dizzying week of parties, rosé, sunshine, swag, and most importantly, inspiration.